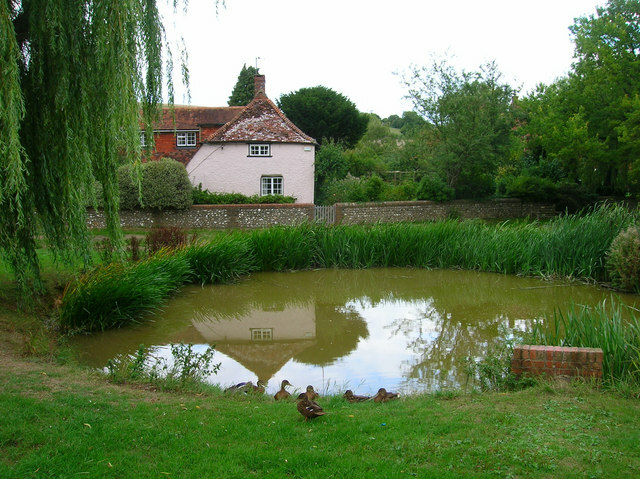 Village Pond and Residents, East Dean, Sussex. © Copyright Simon Carey and licensed for reuse under this Creative Commons Licence. In the opening decades of the twenty-first century, the village duck pond might seem like a quaint anachronism, a little out of step with modern life, perhaps, despite its obvious charms as a wildlife haven and somewhere to relax awhile. For all its modern serenity, however, the village pond was once a place where the scene would be far from quiet and the pond and its green would be at the very centre of village life. Perhaps hard to believe at this time of year, when the tadpoles begin to climb the slippery pole of survival and natural life flourishes all around them, but for their medieval builders, ponds were huge undertakings and aesthetics were probably the last things on their minds. Like the village green it is part of, the pond is often common land, a communal facility for the use of the whole village. Historically the village pond is likely to have provided fish – pisciculture was conducted with great enthusiasm in the Middle Ages – and would have been also used for soaking cartwheels (to prevent them from shrinking), washing clothes and as a watering hole for cattle, either grazing on the green itself or providing water for itinerant droves on the move to market or up the valley for summer pasture. Once those cattle were safely moved up to the downs, another kind of artificial pool, the dew pond, would come into its own. Chalk, limestone and sandstone are porous and, as a result, surface water is absent; dew ponds – sometimes known as mist or cloud ponds – are saucer-shaped circular pools up to eight feet deep at the centre and often constructed in a slight hollow on a hill top. They were made between September and April by touring workers – it would take four men four weeks to make a large dew pond. Traditionally-made dew ponds are lined by puddled clay, though chalk can also be puddled by reducing it to a powder, adding water until it is the consistency of clotted cream, smoothing it out and letting it dry, whereupon it becomes completely impermeable and better suited to the task than the Portland cement sometimes used by modern contractors. Once built, the pond is then – confusingly – not filled by dew (or mist) at all, but by rainfall, while the dew pond’s position in a slight hollow helps keep the water cool and reduces loss by evaporation. Claims are made that the two dew ponds of Chanctonbury Ring on the South Downs in Sussex date back to the Neolithic, but the oldest recorded dew pond is Oxenmere on Milk Hill in Wiltshire, which is named in a Saxon boundary charter of 825 CE/AD.